Microsoft now wants to give public access to the Messenger network via XMPP, an open standard. This means that anyone can build innovative messaging clients, either as a stand-alone or built into devices. This would automatically give access to potentially 300 million active users in the Messenger’s network. Currently there exist third-party applications like Adium, eBuddy, or Pidgin that connect to Live Messenger service, but this have usually been achieved by reverse-engineering the the Live Messenger behavior. Gaining access to the chat network in this way rarely give support for all of the service’s features. There’s no indication that this will change in the short term, at this early stage after the announcement. Only time will tell how open the access will become with the help of XMPP. With this move Microsoft at least now officially show support for unofficial clients for the first time. 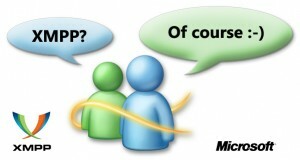 With the release of the XMPP interface for Messenger, any XMPP based chat client, that can also support OAuth 2.0 for authentication, will be able to connect to Windows Live Messenger to enable the users to see which of their friends are online and chat with them in real-time. RFC6121: XMPP: Instant Messaging and Presence. Roster management is not supported. XEP-0054: vcard-temp. The Messenger XMPP service supports fetching vCards, but doesn’t support updating vCards.